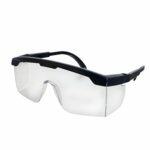 Glasses that are designed to protect eyes from dangerous UV light, chemicals and small pieces of processed materials. UV-400 protection, fog protection, scratch resitance. Lens color: transparent.